While I haven't written about anything Mavic in a while, my love for the quirky stuff they produced is still strong. Good or bad, their products always displayed a uniqueness that I really like. 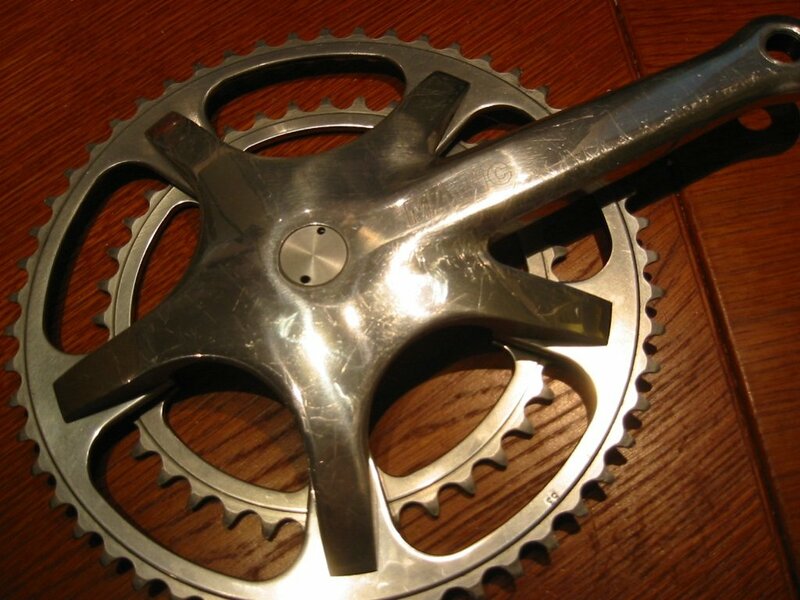 The 631 crank is unique in its aesthetic, but the thing that really sets it apart from other cranks is it was designed to be used as a single, double or triple crank. As a single, the original design allowed you to run down to a 48t outer ring, though a redesign in the early 90's (94 perhaps?) allowed for a 44t outer ring. When used a a double, spacers are used to seperate the outer and inner rings. Things get interesting when using the 631 as a triple. Et voilà, a triple. Where a 631 double was designed for a 113mm bottom bracket, the triple uses a 119mm. Just had the same problem on the small ring. My solution is to drill the remaining part of the star, and to fix all with M5 nuts&bolts. Cut the bolt to the shortest once in place. Beware you'll need some space between the granny and the base. You'll need to remove the star to fix the granny, and don't forget to put the middle ring in place before, it can be tricky to place it on the star after. A nicier solution would be shorten the original bolt, and use an other one (shortened as well) to fix the spacer from the back of the star.